Harry Gordon (left) and Christian Moro rehearse with Boston College’s CCE. Harvard may have won that other Beanpot, but it doesn’t stand a chance in this one. 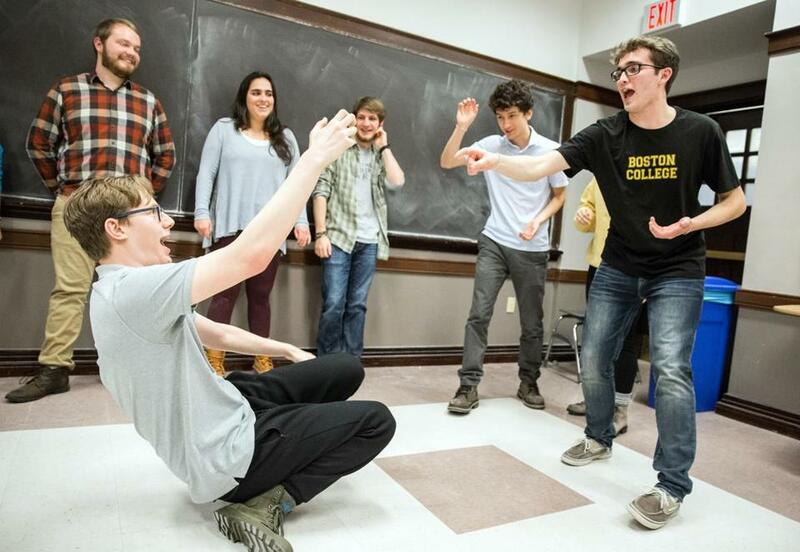 The College Comedy Festival is back this year at the ImprovBoston theater in Central Square, Cambridge. The tournament — known in the improv world as the Comedy Beanpot — is in its 13th year with 14 New England student teams (none of which is Harvard) facing off for the glory (and a big, shiny trophy) that comes with being named the Beanpot champion. 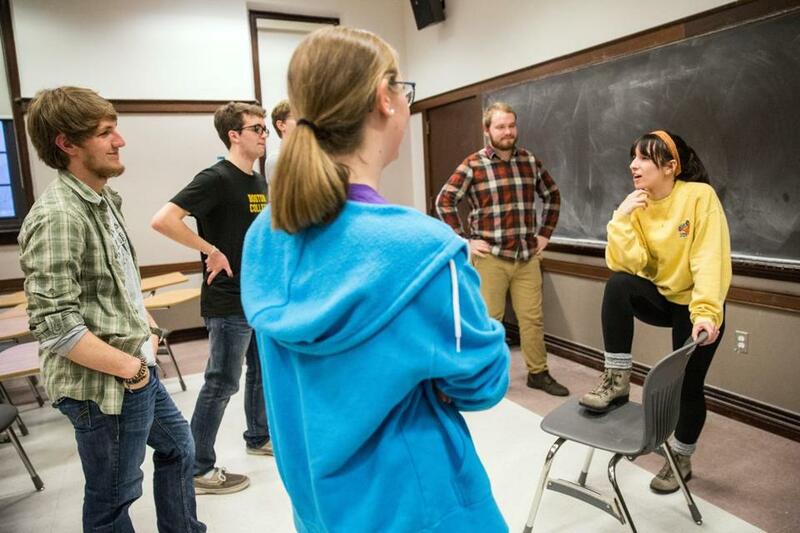 But like the student participants who will perform Feb. 16-18 before audiences of paying customers, the festival doesn’t take itself too seriously. Improv comedy is a spontaneous artform requiring comics to invent their punch lines on the spot before an audience. While the content is original, the festival is structured around three events: a short-form round where teams pick a “Whose Line Is It Anyway?” style game from a hat to perform; a long-form round of more story-driven scene work; and games where performers stand in line and tell pun-based jokes in turn. Though the general outline of the show is planned, the performers have no idea what they will say or do until they’re onstage doing it. Understandably, this makes preparation a little complicated. Enter: Boston College’s Committee for Creative Enactments, known around campus as the CCE. They’ve participated in the festival every year since their oldest members can recall but haven’t claimed the trophy since 2014. Their style is fast, loud, and random, and their practices can be heard echoing through the third floor of Gasson Hall most Sunday afternoons. Passersby can hear snippets of scenes made up entirely from the performers’ quirky sensibilities. In one moment, someone is a tour guide at the Celestial Seasonings tea factory; in the next, another person is trying to return a shirt with a receipt shaved into the back of her head. Marianne Sevilla, 20, one of the group’s coaches, says she views the CCE as an underdog this year. The CCE holds open practices three times a week and selects a subset of dedicated comedians to send to the competition every year. They’ve been practicing most of the 22 possible short-form game options to try and develop a level of comfort with each (acting out a scene forward and backward, limiting the number of words they can use, and lip synching along as someone offstage does their voice, for example) but they say there’s really no way to be fully prepared. After every game or scene, they offer each other tips or tweaks that could have made the exercise funnier, or more fleshed out. Another coach with the group, Connor Desmond, 21, says a lot of the preparation is about putting their comedy into words and trying to make it tangible. 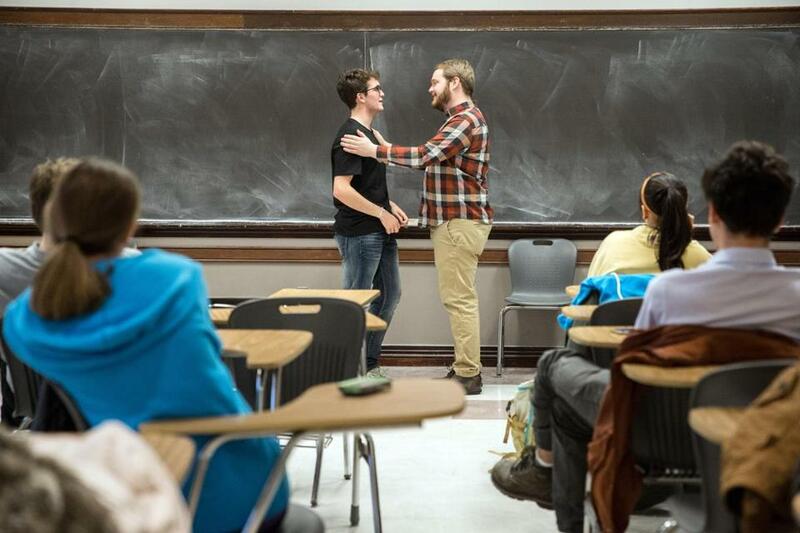 Christian Moro (left) and Connor Desmond in rehearsal with Boston College’s improv group CCE. In the competition, those qualities are exactly what the judges, gleaned from the ranks of ImprovBoston performers, are looking for. Teams are ranked based on their adherence to a cohesive narrative, their skill in creating a realistic world (a difficult feat without props, costumes, special lighting, or cues), and of course, the laugh factor. Though there is ultimately a winner at the end of the weekend, Gostow (an alum of the 2013 Beanpot champions from Gordon College) says there aren’t any losers. He emphasizes the “festival” aspect and wants to celebrate what he calls the unique energy that each team brings. To that end, teams are also invited to participate in performance “jams” with members from other teams and to take workshops and sit in on panels with performing members from the ImprovBoston mainstage. Gostow says in the four years he’s been producing the festival, he’s tried to make it a more welcoming atmosphere and a funnel for students to become ImprovBoston mainstage performers after they graduate. Last year’s champions, the Dimple Divers from Wheaton College, agree that winning isn’t everything. Team member Christine Evers, 20, says the main focus of the Divers is to learn new techniques and enjoy performing. “When I think of improv I think of creating new worlds and destroying new worlds and letting your imagination run wild and having fun with people that you love,” she says. Sabrina Serani (right) practiced during rehearsal. Carly Sitrin can be reached at carly.sitrin@globe.com.